Ever get your boots so thoroughly soaked that they are still damp when you lace them up the next day? What a way to start the morning! Luckily, with a Peet Boot Dryer on duty, you'll never have a soggy start again. For the home there is the Peet 95116 Thermal Convection Boot Dryer Rack, which dries your boots quickly without warming, damaging or shrinking the boots. 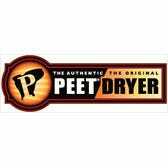 There's the Peet 95117 Portable Shoe Dryer for convenient and silent boot drying on the go. With a Peet Boot Dryer, you'll never have to slip on another pair of wet, cold boots again, all while preventing any premature damaging of your beloved boots. How can you go wrong with a Peet?